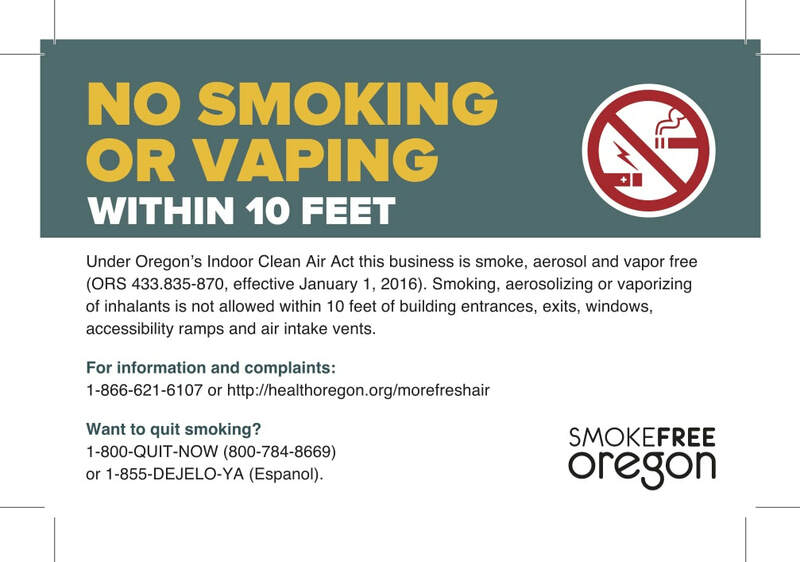 People may not use e-cigarettes and other inhalant delivery systems in any indoor public spaces in Oregon, in cars with minors under the age of 18, or within 10 feet of doors, windows that open, air intake vents or accessibility ramps. Effective January 1st all businesses must post “No smoking or vaping” signs at all entrances and exits. The Smoke Free Workplace Law protects almost every Oregonian from the health risks of secondhand smoke. The law prohibits smoking in the workplace and within 10 feet of all entrances or exits, windows, and air-intake vents. See something? Say something! Anyone can help ensure the law is followed by reporting violations. To report a smoking violation online, click here or call 1-866-621-6107.